Daily Illuminator: Winning The Revolution! January 28, 2012: Winning The Revolution! Let me take this opportunity to thank you for playing my game. Because of you, Revolution! has done so much better than I had ever dreamed -- except for that dream where I won the Spiel des Jahres, but I digress. Have you ever wondered how I play Revolution! or what strategies I employ against my friends and family? I've just written a short strategy article describing that very thing called Winning the Revolution. 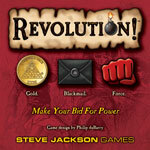 Check it out and tell me what you think at www.dubarrygames.com, on Boardgamegeek, or on the Steve Jackson Games forums.